Gilbert, the older of the renowned Hernandez Brothers, seems to be stretching himself in new and more extreme directions all the time. Where Jaime’s work becomes more refined and focused on the perfect rendition of a moment (emotional, temporal, physical), Gillbert, or Beto as he’s also known, has been getting darker and nastier. Love from the Shadows and Speak of the Devil both danced on the edge of what’s acceptable and showed glimpses of what lies underneath the masks we all wear. But Marble Season is another thing entirely: wholesome. 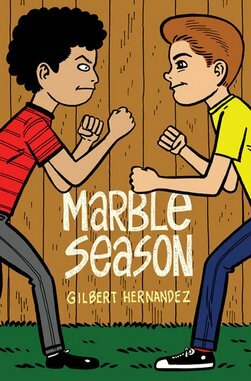 Marble Season works much in the same way as the Love and Rockets chapter Palomar: The Heartbreak Soup Stories, presenting a loose intersection of characters traveling through a relaxed narrative arc, but in this instance the average cast member is ten. The characters have older and younger siblings who enter the story as well, but the title refers to a brief period of childhood marked by a special autonomy, where you’re free to roam and experiment outside without being enslaved to your hormones. The boys steal, read comics, beat each other up, play superhero and army guy, and create a shifting system of alliances. The girls show up here and there, but are less the focus of the action. Beto’s art has never been as polished as Jaime’s, but it has its own appeal, and the repetitive 6-panel grid of these pages allows different character designs to shine. Some figures resemble those from Peanuts, others from Archie, and although their posture can appear stilted and their body and facial expressions aren’t exactly subtle, this simplification also intensifies the kids’ emotions. Marble Season isn’t a great work, but its failures double as its strengths. It’s too shambolic, like being inside the head of a child, where a lack of comprehension and perspective surrounds its characters’ actions. But this same approach also captures the combination of assuredness and mystification that defines youth.